Citation Information: J Clin Invest. 2005;115(2):231-233. https://doi.org/10.1172/JCI24270. The potential threat of the smallpox virus as a bioterror weapon has long been recognized, and the need for developing suitable countermeasures has become especially acute following the events of September 2001. Traditional antiviral agents interfere with viral proteins or functions. In a new study, Yang et al. focus instead on host cellular pathways used by the virus. A drug that interferes with the cellular ErbB-1 signal transduction pathway, activated by smallpox growth factor, sheds new light on how the virus replicates in the cell. Drugs that target the ErbB-signaling pathways represent a promising new class of antiviral agents. Possible mechanism for SPGF-dependent pathogenesis of variola virus and the inhibitory effect of CI-1033. SPGF binds to the ErbB-1 receptor, inducing dimerization and activation. Active phosphorylation of relevant receptors, through unknown mechanisms, may render the cell permissive for viral replication. Phosphorylated ErbB-1 can also activate c-Src kinase as well as the actin polymerization complex, which regulates the formation of actin tails within the cytoplasm. c-Src in turn activates the viral A36 protein, an event required for activation of the actin polymerization complex. Viral replication yields IMVs, which are released from the host cell through cell death and lysis. Alternatively, IMV particles are transported via microtubules and wrapped with additional membrane and protein components to form intracellular-enveloped virus (IEV) particles. IEVs are transported to the cell membrane where they fuse with the plasma membrane to become cellular-enveloped virus (CEV) particles and activate the actin polymerization complex. 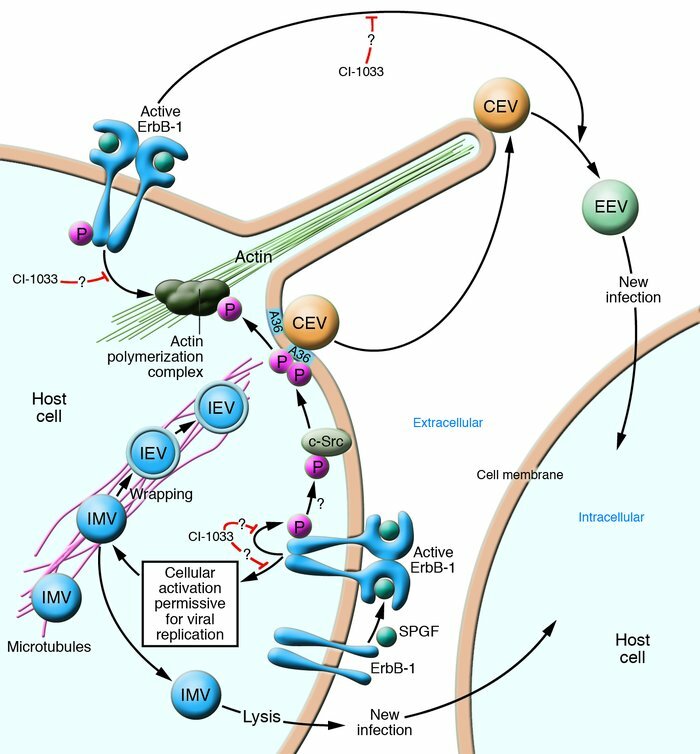 Some CEVs are released from the cell as EEV particles, which rapidly disseminate the infection. CI-1033 can block the phosphorylation of ErbB-1 and subsequent c-Src activation as well as activation of the actin polymerization complex, which as Yang et al. (8) speculate, may play a role in viral extrusion. CI-1033 may also interfere with events that render cells permissive for viral replication. Figure adapted with permission from Science (15) and Virus Research (13).